Here’s what strikes me most about the Incas; it was the mastery of food production and storage that enabled their empire to rise. The history goes on to tell of the psychological and military tactics used by the Incas to grow their territory but I can’t get beyond the fact that it was only when they had strong agriculture and confidence in food supply that workers were able to embark upon projects like building roads and expansion. And there is very little doubt that their food sources were local and organic. Beneath Inca rule, the Andean civilization flourished. Their roads were built into a high-altitude network. Inca farmers moved their crops up the slopes and built agricultural terraces where they grew more than 70 different native crops. 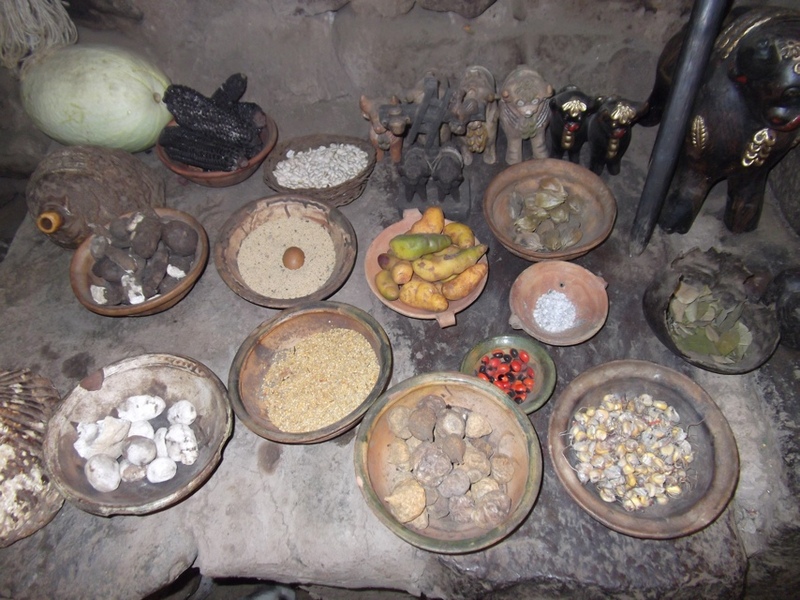 The success of their farming caused a need for Inca stone masons to build vast food storage structures where up to 7 years of food was kept and intricate inventory systems were built to manage the contents. So, what’s changed in the last 500 years? From the meals we’ve eaten, I’d suggest that the food supply remains diverse with corn, potatoes, quinoa, and amaranth as staples. I come across a recent article indicating that childhood malnutrition has dropped by as much as 9% in recent years. The elimination of hunger caused this area to flourish once and it appears that by returning to this focus, it just may be poised to do it again. Doesn’t it make sense as a starting point for all civilizations? Tammy, I am so excited for you, this journey and knowledge you are learning and sharing. I am anxious for you to try MACA, a favorite of mine, and hopefully you can enjoy it as a whole food, where as I can only buy it in powder form! Enjoy and keep sharing. It is so interesting. I’ll look for Maca Sally and I’ll take lots of photos to share. Wow, what an amazing trip! It is because of roads to other areas of the world that we have been able to use food techniques and ingredients from other cultures. Now, I love food–to cook and to eat; however, if you placed traditional Andean ingredients (as in your photo) next to, say, Italian or Greek ingredients, hands down I’d go for the Italian or Greek. Where is the color? How does the color, texture and aroma effect what we eat? I hope you collect a few recipes from your travels so we may try them here at home when you return. There is a huge variety here. I love all of the fresh vegetables and legumes. It’s super easy not to eat meat. And I couldn’t bring myself to try the alpaca. That’s really interesting! I’d love to see some of the cooked dishes you are eating and what has been your favorite. I’m so excited to read your update, and impressed that you are managing to post it on an Ipad from Peru! Interesting points, you are making me think. Thank you and have fun! I am a bit proud of myself if I do say so! It took me a while but I’m pleased to have figured this out. I am very impressed! Muy bien! Thanks Nancy. This is a beautiful country! How exciting a trip. Peru has some incredible food, and the diversity is really amazing. If you ever make it to SF, there’s a restaurant La Mar that you should visit. I did a post on Peru over a year ago and was in awe of the diversity and influence – including Japanese that touches the food. Look forward to hearing more details. To your point about elimination of hunger causes civilizations to flourish, I think is spot on, as hunters people are constantly on the move, but once they can become more agrarian and set down roots, the cultural aspects take hold. And today, if we could eliminate it (AND we have enough food to do so), then we can move on to other important issues like flourishing. Very interesting and exciting such a trip will be! Wish I had your caliber of photography skills. I just want to add that not only are they diverse in depending on different staples, but also that Peru has an incredible diversity within each staple. I don’t remember how many potato cultivars are common, but it puts the rest of the world to shame! And, of course, offers producers a range of production options in terms of tolerance to drought, extra rain, heat, cold, pests/disease, and local microclimates. Having that diversity of crops within species is vital to maintaining food stores and being able to extend energy on other pursuits (like, say, blogging? ;-)). Have you had any purple potatoes yet? I have! The varieties of potatoes are endless. I’m jealous twice over: first the trip to Peru, next the iPad! Loved the post – couldn’t be more true! Both are helping me celebrate a big birthday and are really special! I loved learning about this area, the history and the importance of food for a civilization to flourish. Thank you so much for sharing this with us!!! You’re welcome Debbie. You’d love the spirituality of this place too. Tammy — this is SO cool! I look forward to reading much more about this trip. I’d love to get together after you get back. I love it here Diane. Would love to meet up on my return. Peru? You are a dark horse, Tammy. Have a fabulous time, hope you share more with us. WiFi is sporadic but I will try. Peru! How wonderful! Can’t wait to hear more about what you learn/ruminate on. It does make sense. Tammy, what an exciting post, straight from somewhere so exotic, and full of insightful analysis about the origins of an empire. You have brightened my morning! Thank You! You are welcome. Wifi is pretty sporadic so you may have to wait until I return to hear more. Interesting adventure! SOunds like an amazing trip. I had never thought about the connection between the mastery of food storage supply and the growth of a civilization, but it makes sense. We take that so much for granted these days, but it really is the basis of culture and civilization. Thanks for sharing your journy with us. This is a beautiful country! I’m hoping to share more. Food, glorious food! God is so good to give us foods. I know this generation eats better than those generations behind it. While I grew up, many foods came from cans. Rarely did we get to taste fresh fruit. In fact, as an adult, I had to acquire a taste for it. Now, I love fruits and fresh vegetables. I buy only a few canned foods. Sounds like you’re doing the right things and eating the right things. How exciting! What an adventure you are on and I’m so glad you are keeping us updated! Have a FANASTIC time!! Sometimes it better not to complicate things and get back to basics. WONDERFUL! What a great post. Big birthday, eh? Well, HB – are you a Taurean? Loved, loved, loved this post. I’ve always wanted to go to Peru and your travel reporting is whetting my appetite. And I so agree, that a well-feed population, fueled by nutritious food is a great foundation for a blossoming civilization. Have you been to Macchu Pichu yet? Yes! I spent the last two days there. Amazing! And no, I’m an Aries. Want to do a reading for me? Tammy, what a thrill. This is technology at its best. You are such an inspiration! Technology is really great, isn’t it? I’ve had quite a bit of trout here and have really enjoyed it. Sounds like a great trip, Tammy. Looking forward to the photos! I’ve put a few through on a wordless post but will share more when I return. I think it’s very important what you mentioned here – while most people only think of military tactics, religious cults, and breath-taking architecture when thinking of ancient cultures – and these things *are* amazing definitely! – the importance of basic nutrition is often neglected. Maybe this is why we take it for granted nowadays that our nutritional needs are well-provided for? You’re not alone in not having thought about it but it makes sense, doesn’t it? I will be sharing more about my trip soon. what wonderful experiences you are having on this journey! I have read a little about the cultural reverence of quinoa, which was all but obliterated by missionaries. it’s cultivation went “underground.” only in the past 20 years have we seen such global embrace of this nutritious mother grain–now greater cultivation is likely assisting the economy, also lowering malnutrition. From what I understand, it carries more protein than other grains and it’s quite prominent in the Peruvian cuisine. Peru is on my trip wish list. How exciting! The peasants who worked on the pyramids were given tax breaks and were taken to pyramid cities where they were given shelter food and clothing he noted…According to Redford ancient Egyptian quarrying methods — the processes for cutting and removing stone — are still being studied. I’m sure they will discover similar methods in Peru and in Egypt. Great post Tammy. I have had high interest for Peru since I made my first trip to there sometimes in 1970ties. As a result of my many trips, my daughter is called Inca. In Finnish language there is one oddity. The word potato is in Finnish peruna. You see the connection between Peru and peruna. 🙂 I do not why it is called so, because “wise men” say that the Finnish word is coming from Swedish word päron. I still wonder myself. I wish all the best for this year to You and Yours. That is very interesting Matti. Peruna! Happy New Year.